At the gate for my JFK-GRU flight on 777-300, I just had a GA confirm that EXP and CK get complimentary upgrades to PE if there is availability. There was about 5-6 agents there and she literally raised her voice to let them know that me being EXP, I should have a complimentary upgrade to PE. A flight attendant on board escorted me off the plane back to the gate to help me get my seat in PE. Upgrading to Pe for me in my previous roundtrip flight from São Paulo, however my company decided to book this ticket thru LATAM, therefore making my booking ineligible for ANY type of upgrade or seat assignment in another cabin. CK rep says it's goodwill and will not be published as stated benefit. Do you have more information? Have them check their webref. Keys and EPs can request for PE. No one wants to discuss the fact that the OP was offered a free upgrade IN THE MOBILE APP at check-in? That's a pretty big development, IMO. JDiver, golfingboy, 355F1 and 8 others like this. 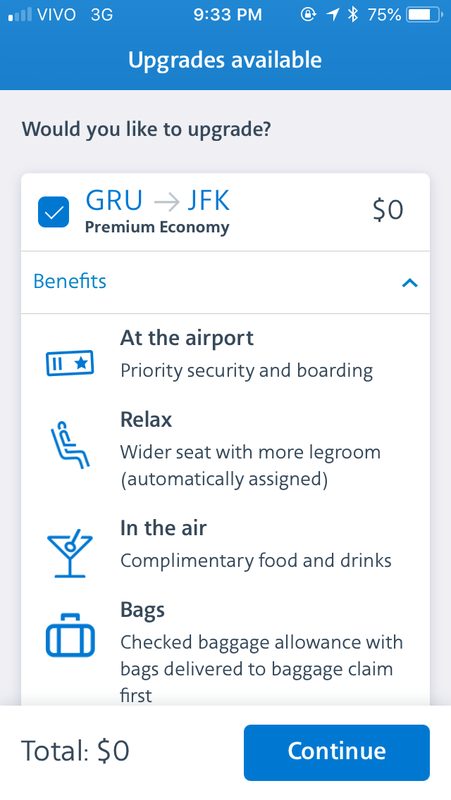 I would like to know a little more about the in-app upgrade offer on 2 July for your GRU-JFK. Did it just pop up in the check-in process? Or did you have to work to access it? Was the only option PE? No J upgrade offered? Yes the screenshot I provided above happened during the regular app check in process, I didn’t do anything different. I dont recall what step in the process is ocurred. But this flight on 7/2 when it happened was during the first week PE was sold on this route. I was shocked to also see it. There was only an option to upgrade to PE. ...No one wants to discuss the fact that the OP was offered a free upgrade IN THE MOBILE APP at check-in? I guess I missed seeing that discussion. This is the first example of an EXP getting a LFBU to PE complimentary in the app I've seen. AA finally catching up to modernity here by offering these types of things in the app. I've cleaved off several chunks of this thread to both bring it back to the actual fact facts and to remove meta and overly-personalised content. I've also updated the thread title based on the latest information herein. Near as I can tell, it is now free of misinformation and should be on topic. JDiver and allaroundtheworld21 like this. Where can I reference this so I can show an agent at check in next time I fly? I usually travel to Brazil and need to check in at the aiport because of the visa check, so no option to check in online or app at JFK. The free upgrade offer from the app is certainly exciting, but I'm curious how it interacts with any uncleared SWU/miles + copay requests on the back end. If AA is indeed working on building PE as a separate stop on the Y>PE>J>F upgrade chain, then it would make sense that the system would count these upgrades to PE on the app as "upgrade completed," and void out any other requests. Has anyone noticed what happened to their J or F requests after accepting a PE upgrade on the app?